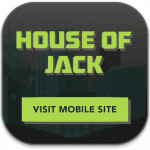 House of Jack is one of the newest online casino brands to hit the World Wide Web and is primarily aimed at Australian, Canadian and New-Zealand players. Fully licensed in Curaçao by Curaçao eGaming, it is a trusted and safe betting site to play over 600 real money slots and table games. Big names such as BetSoft, Microgaming and Quickspin fully support the site with their stellar games software catalogues. House of Jack also has a great list of banking options for players worldwide, and along with instant-play desktop and mobile casino sites, makes playing blackjack, poker, roulette, slots and more easy and hassle-free. House of Jack has a generous welcome bonus promotion for all new players who register an account on the site and deposit real money at least three times. You can get up to €/$ 450 and 100 free spins, the latter of which can be used freely on three of their online slots titles – Book of Dead, Hugo or Pimped – and it’s a very simple and streamlined process to get your starting reward. All players can still get additional matched deposit bonuses even if they don’t deposit the maximum amount – just make sure it is at least over $20, as that is the minimum amount to qualify for the sign-up rewards bonus. 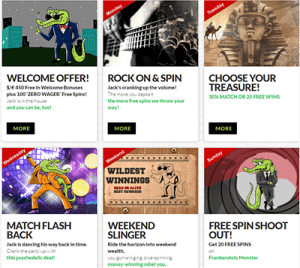 The free spins are awarded in increments of 10 a day over the next 10 days. Note: The House of Jack Casino welcome bonus has a 50X wagering requirement on the sign-up bonus, but all free spins are exempt and are wager-free. House of Jack offers over 600 real money games for members playing on desktop computers, laptops, mobile (Android, iPhone, iPad, Samsung) smartphones and tablets. All games are instantly accessible and playable on any of these devices, which means you don’t need to download any special casino software to play them. This is what is referred to as a ‘no download’ online and mobile casino website, and it makes getting into the game very convenient and hassle-free. HoJ hosts games in the following categories: Top 12, Video Slots, New Games, Classic Slots, Blackjack, Roulette, Table Games, Video Poker, Jackpot, Other Games, 3D Slots, Favourite Games and All Games. The types of casino games available at House of Jack include: 3D games, baccarat, blackjack, bingo, casino hold’em, craps, keno, poker, roulette, scratch cards, and online slot games in multiple formats – 3D, progressive jackpot, three-reel, five-reel and Ways to Win. Current software developers hosted at House of Jack: BetSoft, Microgaming, Play’n Go, Quickspin and Spigo. We found the current selection quite diverse, but a notable section is completely absent: Live Dealer Gaming. It is advertised on the site but is not currently active. Payment and withdrawal options at House of Jack is very clear and very easy thanks to 24/7 live chat customer service and a comprehensive banking page, which is always a plus in our books. All transactions at the site are protected by 128-bit SSL digital encryption systems, which is the industry standard for both trusted financial institutions and online casinos, and multiple currencies are supported, including AUD, CAD, EUR, NZD and USD. Players from Australia, Canada and New Zealand each have their country-specific deposit and withdrawal methods listed on-site, along with supported currency types, total time it takes for funds to transfer between accounts, whether a deposit option can also be used for withdrawing winnings, and the payout time-frame for how long it takes for House of Jack to get your money to you. Players from all other countries are catered to as well. House of Jack is a rapidly expanding online casino with a ton of future promise, but one which could use a bit more polish in the general site design. It also needs live dealer gaming, especially considering it openly advertises it on certain pages. Other than these few drawbacks, we highly recommend it to Australian, Canadian and New Zealand players in particular as a great site to play your favourite online slots and table games with generous welcome bonuses and a dedicated loyalty membership system. New players can sign up at House of Jack Casino here to claim up to $450 in matched deposit bonuses and 100 free slots spins.